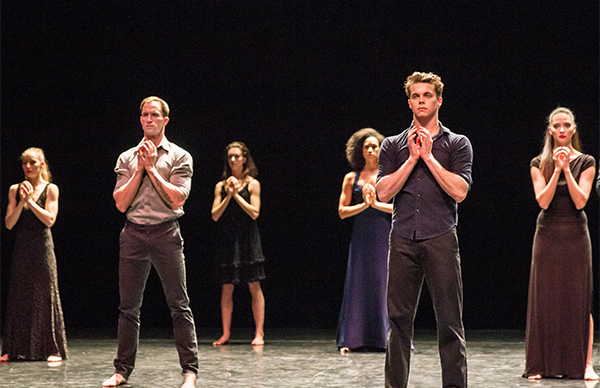 The Lamentation Variations is an event that was originally conceived to commemorate the anniversary of 9/11. It was premiered on that date in 2007. The work opens with a film from the early 1940s of Martha Graham. We see her dancing movements from her then new, and now iconic, solo, Lamentation. The variations were developed under specific creative conditions. Each choreographer was asked to create a spontaneous choreographic sketch of their reaction to the Graham film, and was required to adhere to the following conditions: 10 hours of rehearsal, public domain music or silence, basic costumes and lighting design. Though it was planned to be performed on only one occasion, the audience reception for the Lamentation Variations was such that it has been added to the permanent repertory of the Martha Graham Dance Company.